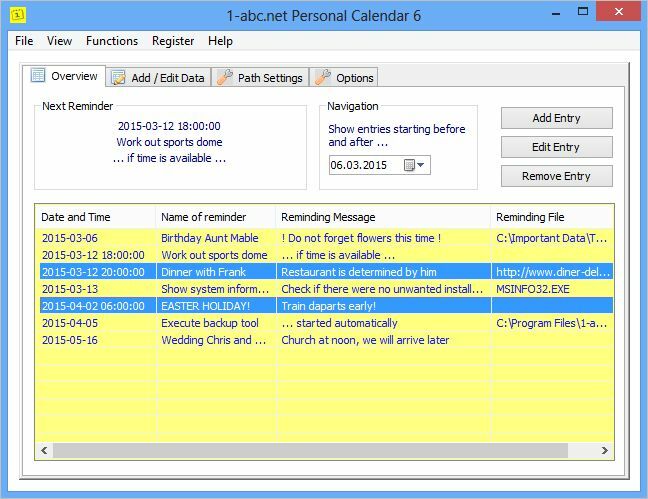 1-abc.net Personal Calendar - Let your computer remind you on important appointments! Let your computer remind you on important appointments! Let us be honest: Do we not all forget important dates and appointments from time to time? Meeting friends, doctor’s appointments, visit relatives, sports training, birthdays, weddings … there are so many things to organize and it is not always easy to keep best overview. This can be so much easier with 1-abc.net Personal Calendar. With this program you can organize as many appointments as you wish, and your computer will show you a reminding message automatically. 5 kinds of entries are available. Reminding for one time may be one of the most used, but also reminding options like on a special day of the month, on a special day of the week or each x days or weeks are very useful features that make reminding much more effective than before. Independent from the kind of entry you can also determine a special reminding time in hours, minutes and seconds. Another nice option is that you can execute any file you want together with the reminding message. This could be your personal calculation file that you want to fill in each Friday, this could be a music file when you want to visit a concert or a photograph of your nephew on his birthday. There is no limit how to use this option! This program requires only very few system resources and runs nearly unrecognizable in the background. Anyway, whenever you need it you can always execute it from the systray icon at the right bottom of the screen. The data base is based on SQLite, so you can additionally organize your data with many other SQLite programs. Concentrate on the really important things in your life and let 1-abc.net Personal Calendar do the annoying work of organizing appointments for you!